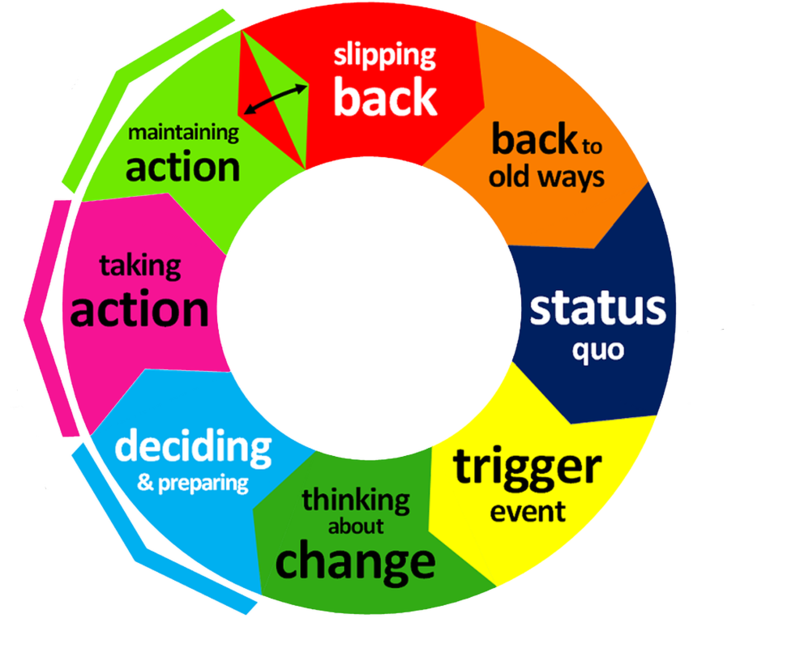 The 'Slipping Back Stage' of Change is one of eight stages within the Exercise Motivation Change Cycle or EMCC. 'Slipping Back Stage' course and discover how to get back on track and Make Change Stick For Life! take the 'slipping back' course now! 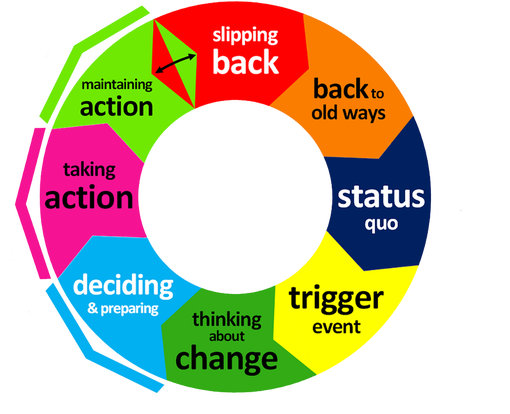 The Transtheoretical Model of Behaviour Change describes how people (just like you) can move through various stages when they make change in their lives. The research behind the model is dedicated to solving the problem of ‘how people intentionally change their behaviour’. The following question was the foundation for the research. "Are there basic steps or stages that commonly occur when people make a change?" The answer was… YES! The research showed there are similar stages underlying any behavioural change, and thus the Transtheoretical Model of Behaviour Change (1983) was born. The following diagram, the 'Exercise Motivation Change Cycle' is an adaption of the original model (click to enlarge). An event occurs that kick-starts you into contemplating change. This event could be a small thing, like a comment from another person, or a big thing like a health warning from a doctor. Maybe you do, or maybe you don’t want to change. At this stage you would be weighing up the pros and cons of change. You could be ambivalent (sitting on the fence) or you could be sure you want to change. You want things to be different, or you have decided it’s not worth changing. After thinking about change you have now made a decision to either change or not. If you have decided to change you will now need to prepare. You are now walking the walk. This is where you put your plans into action. It’s all systems go as you use initially high motivation to get things started. Alternatively you may get a shock, as you find actually doing it is harder than you thought. This is for real! This is where you start to see the light at the end of the tunnel and realise that this change could be for real. If you maintain your action for long enough you will exit having made a long lasting change. Alternately your initial motivation will fade and you find yourself questioning why you’re changing in the first place. You've done so well for so long so you can let your guard down. This is a dangerous stage and will often see you re-engaging in old behaviours. Often justifications and minimisation of behaviours will occur at this stage, e.g. I've been going so well, I can afford to miss a workout. Stuff it, this is too hard. This stage begins when the maintaining action stage has been left to languish and the previous stage, slipping back, has become dominant. You've now completed the cycle and will soon return to the status quo stage.